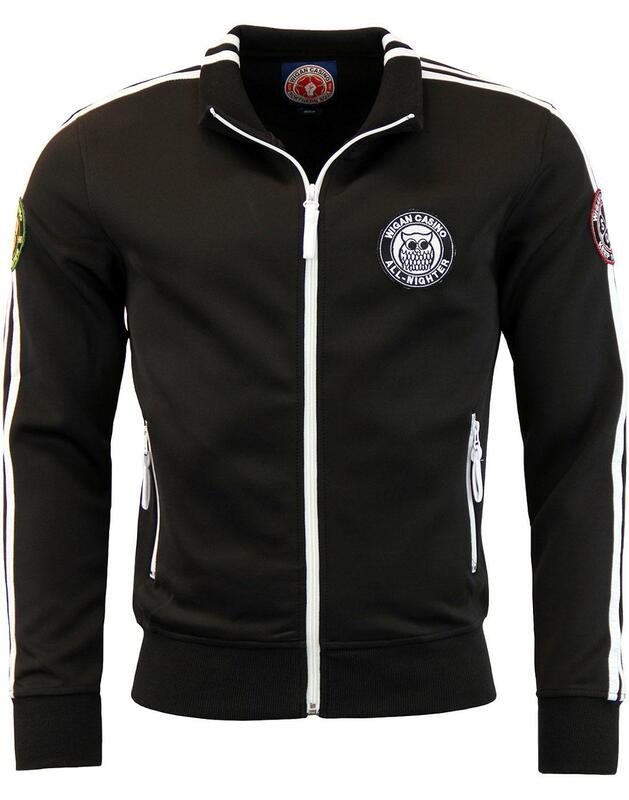 Wigan Casino Northern Soul patch track top in black with Retro twin stripe detailing to sleeves. Carrying a collection of Cool Retro patched encapsulating the wigan casino era. It's time to re-visit the iconic All Nighters, play some Northern Soul tunes and 'Listen To the Memories' . 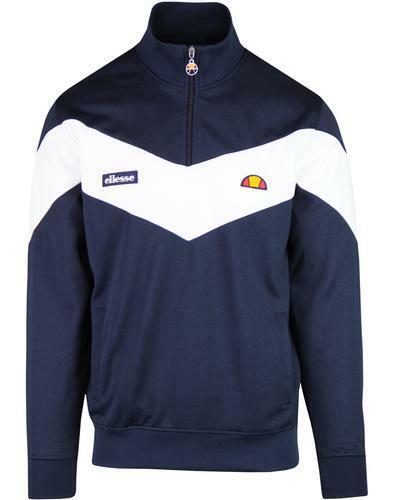 This fab Retro funnel neck track jacket hones in on the 'Heart of Soul' and pays homage to the legendary Wigan Casino. From 1973 to 1981, Wigan Casino built it's reputation as the primary venue for Northern Soul. DJ Russ Winstanley ran the legendary All Nighters which as well as spinning top soul tunes also played host to some of the finest names in Northern Soul with the likes of Edwin Starr, Jackie Wilson and Junior Walker taking to the stage. On that fateful night in 1983 when the club closed it's doors for the final time, Winstanley's last tune was Frank Wilson's soul classic 'Do I Love You (Indeed I Do). This fab collection of Northern Soul Clothing ensures the Wigan Casino legend lives on - Keep The Faith! Ribbed 1970s style funnel neck collar, cuffs and hem give it a true Retro edge Stunning 2-tone detail with twin Retro stripes to each sleeve and contrast zippers to pocket and zip through fasten. Fab All Nighter aesthetic is a fitting tribute to the amazing wigan casino days! 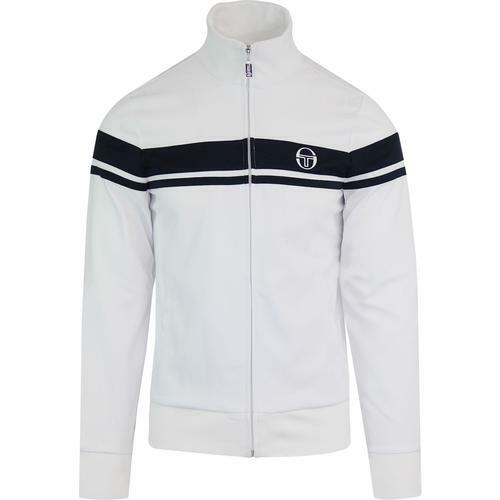 - Wigan Casino twin stripe Northern Soul patch Track Top in black. - Twin retro stripes to neck and sleeves. 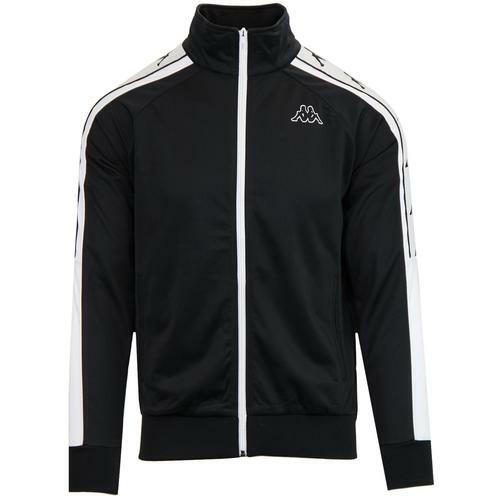 - Contrast zip and fabric zipper. - Ribbed 70s vintage funnel neck, cuffs and hem. - 2 front pockets with fabric zippers.